← Lina Gottesman Interviewed by the NY Post! Altus Metal, Marble and Wood CEO Lina Gottesman (center left behind sign) was invited by BALI Executive Director Liz Abzug (short hair, left of Lina) to speak at the Millie King Entrepreneurship Program of the Bella Abzug Leadership Institute (BALI). Oriela Baliaj (kneeling, right of sign) is Program Associate; Ebony Wilkinson (kneeling, left of sign) is Program Coordinator. Photo credit: Bharvi Chavre. When I heard those words from a motivational speaker over 20 years ago, they immediately hit home and an inward cry of ‘YES!’ shot through my head. It was as if he was talking directly to me: caring and concern for the customer has been the guiding principle of Altus Metal, Marble and Wood since its launch in 1989. Altus is derived from the name of a Greek mythological bird that symbolizes excellence. I chose the name because I determined from the start that Altus would always be uncompromising in its standards, consistently demanding the highest quality workmanship on every project we undertake, no matter how small or how large. I, Bob, and our entire team have never wavered in our allegiance to that principle. 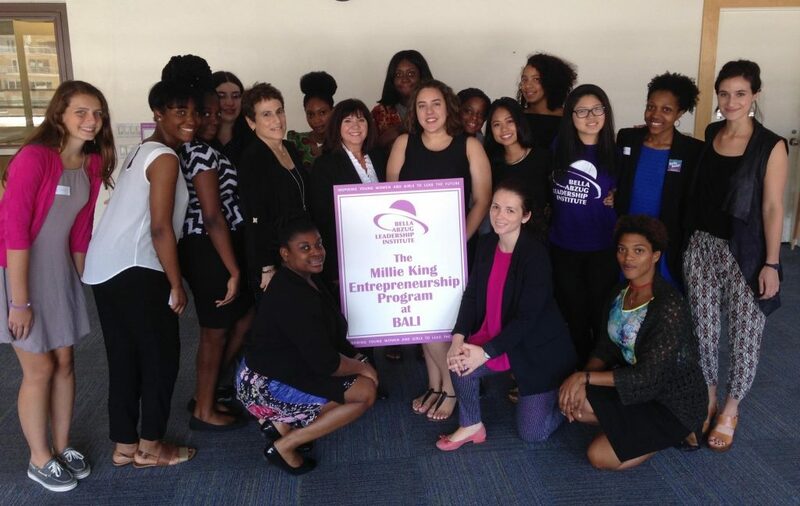 A couple weeks ago, I had the honor and privilege of being invited to speak to a group of approximately 30 young women trainees, mostly high school graduates entering college in the fall and college freshmen and sophomores, at the launch of the annual Millie King Entrepreneurship Program presented by the Bella Abzug Leadership Institute (BALI) at Hunter College in New York City. I was invited by none other than Bella’s daughter, Liz Abzug, executive director of BALI. I noticed that when I told the group about the quote above – the one about putting commitment to the client above all – a murmur of recognition spread throughout the crowd. They were young and new to the world of business and entrepreneurship, but they got it. They understood instinctively the wisdom and truth of that statement. Liz Abzug tells me that the talk I gave to the young women was successful, that they left feeling inspired and even empowered. Nothing could make me more proud. Their probing questions showed a wisdom beyond their years, and I was quick to tell her that I was extremely glad to hear that they gleaned something from me, because I surely learned a great deal from them. This entry was posted in Speaking Events and tagged Bella Abzug Leadership Institute, Millie King Entrepreneurship Program, Speaking events. Bookmark the permalink.